As the party who has rented some temporary fence, it is your responsibility to manage and care for it. In order to keep up your rental fence and maintain it, you can check out the tips below. This will help you avoid any complications or rental fees at the end of your rental. During the spring and summer, weeds are bound to grow up and through your chain link material. Unfortunately, pulling weeds out of the mesh can be near impossible. In some cases, the renter would be better off to just throw out the fence materials and charge the customer for damages. In order to avoid this, contractors should mow and spray around the fence during their rental period. This will also increase visibility and discourage potential burglars from hiding in the weeds. Fence materials removed due to accessibility need to be kept and accounted for onsite. 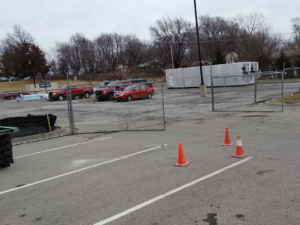 Contractors are always relocating and removing rental fencing. No matter how much materials get changed or moved, do not let the rental materials leave the site. It may be convenient to move a couple panels to another site, but it can also be quite costly. Rental companies do track the quantities installed and will bill you the full retail price for any missing materials. Rental fence panel stands are typically weighed down with sand, either in a block or a bag. For best results, check each day to make sure all sand materials are still squarely placed to hold down the stand. Sand blocks may slide off or bags may break open. Under even moderate winds, a weighted rental fence panel installation will blow over like a house of cards if not weighted correctly. Not only would this leave your site vulnerable, but it may cause considerable damage to passing pedestrians, nearby properties and parked cars. Never bury any of your temporary fence materials. Grading contractors will grade right up to and over temporary fencing. It is not easy to pull out these materials once they are buried. The fabric will almost surely need to be replaced because it does not stretch or spring back into shape. It is crucial that you remember that while our temporary fencing is installed on your site, you are responsible for caring for it. If you are in need for any rental fence for an upcoming job or project, please contact us today for your free estimate. Copyright ©2017 The American Fence Company and American Fence Rental Company. All Rights Reserved.